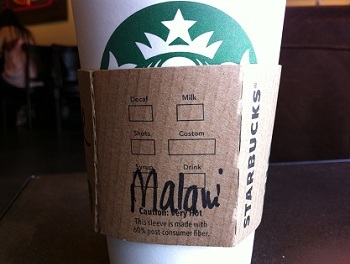 African coffees are not usually my favorites, but I can never resist trying a new offering from the Starbucks Reserve line, so I eventually gave in to trying the Malawi Lake of Stars coffee a try on a recent visit. I have to admit that I did wait until my store was sold out of the Galapagos coffee before making the switch, which is what took me so long to getting around to this post! I am willing to admit when I was wrong, and I was definitely wrong to put off trying this particular coffee for so long. The coffee is rich and incredibly smooth, with none of the citrusy acidity that I often find in African coffees. It did, however, have a trace of citrus flavor to it, but that was subtle and came only after a long, lingering chocolatiness that really dominated this coffee. The finish was clean and smooth, too. I like mine hot, but have since gone back and tried this iced and found it to be very refreshing, with the same flavors coming through and without any bitterness. It almost makes me glad that my Clover store is out of the Galapagos, because now nothing stands in the way of me getting the Malawi reserve.